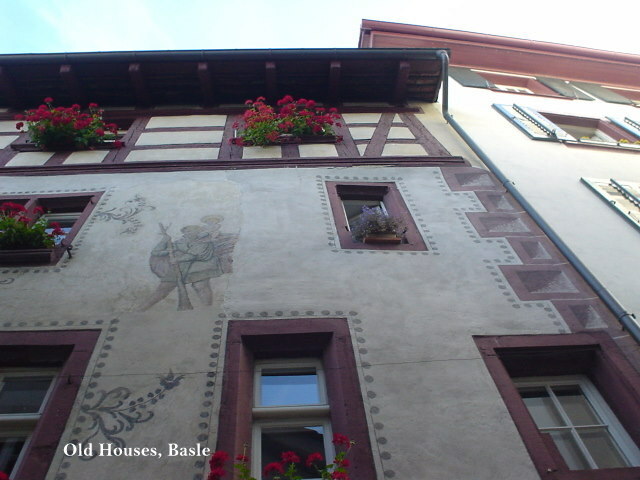 We visited Basle, having promised to visit a good friend (for the last 44 years!). We finally made it (via Gatwick and Easyjet) in September 2011. It was an ideal time to go and we were blessed with good weather for six days out of seven. The flight seems to take no time at all....it is just an hour. Fairly cramped, expensive coffee and only allowed one case in the hold between two, unless you pay extra. Take-on bags were restricted to one each, which must comply with their strict size limit. You are not even allowed an extra handbag or netbook on these economy flights. You have to cram them into your allocated bag. But, otherwise, the check-in procedure went smoothly enough. On one occasion, flying Easyjet, the check-in girl noticed my hearing attachment and gave me a special boarding privilege ! We got on before anyone else, which is an advantage on Easyjet, as you get the choice of seats. None are allocated, except for the Fast Boarders, who pay extra. I felt I should walk to the 'plane with a pronounced limp ! 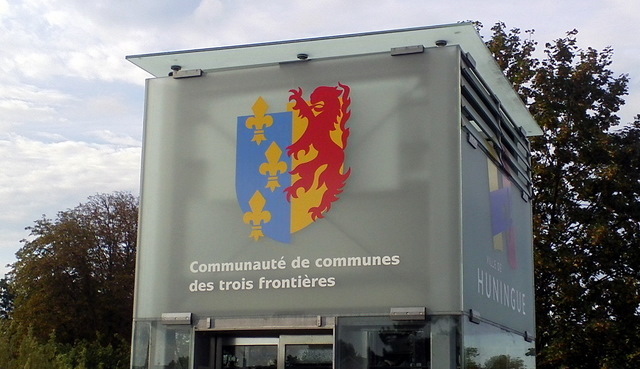 Basle/Basel (depending on whether you speak French, German or Alsation) has a small modern airport and you still have to decide whether you are exiting to France or Switzerland, although there are no obvious borders elsewhere. 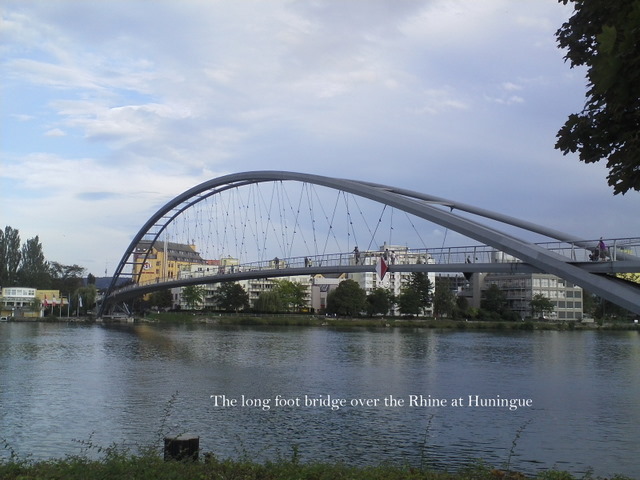 In fact, one of our first visits was to Huningue, which is a town on the French, German and Swiss borders, where people cross the Rhine to go shopping in Germany because they get more for their money. In the evening an energetic trolley boy comes over the longest foot and cycle bridge in the world to retrieve all the supermarket trolleys. Germany occupied this part of France but stopped the tanks short of Switzerland. 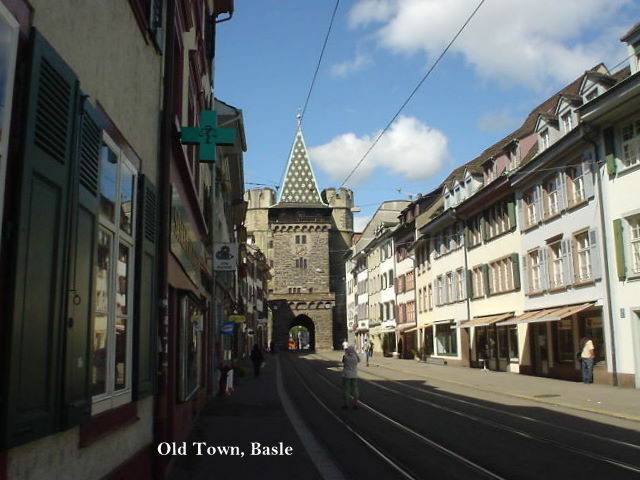 Basle is a smart, historic, university town with many old buildings and smart shops and restaurants. 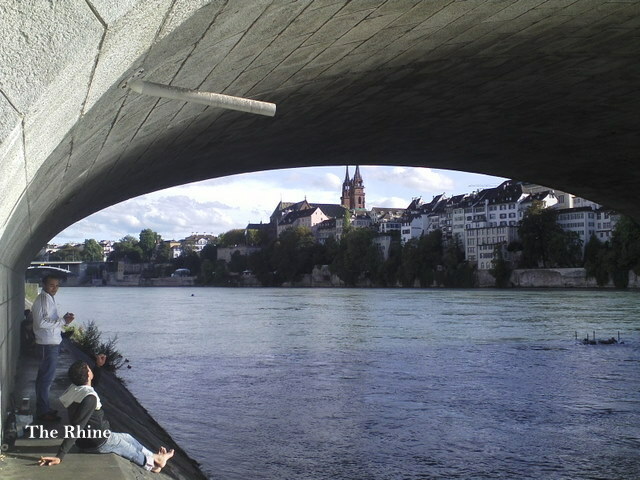 The Banks of the Rhine are popular for sitting around and sunbathing and even swimming. There were many heads bobbing up and down, all going downstream, many of them with inflated bags containing their clothes. It was obviously considered clean enough not to suffer "Thames Tummy". In fact the whole city was litter free and with little sign of graffiti. The tram system is popular, so many people park in the suburbs and take the tram into town, hence little congestion. One has to be careful when crossing the roads as the trams are very frequent and quite fast (and quiet). 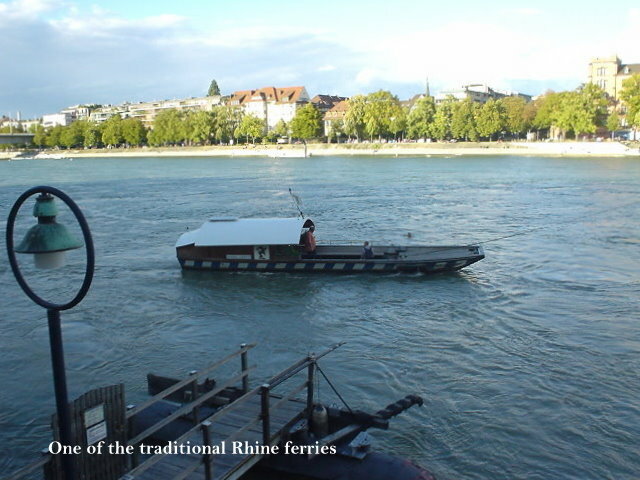 I was intrigued by the small foot ferries which cross the Rhine in several places. 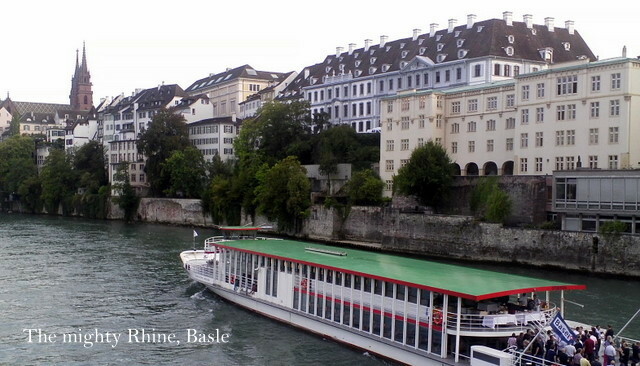 They are an old tradition in Basle and the ferrymen get well known to the locals. I could not see how the ferry worked as it does not have a motor, just a rudder. But the secret is that they are attached by a cable to another cable which is strung from one bank to the other. The ferryman merely moves the rudder over at the end of each trip and the current does the rest. Why isn't this very 'green' invention not applied to more rivers around the world. It is probably not applicable to the Thames, which is tidal, so there would be times when the ferry could not run. And the cable must be high enough not to interfere with river traffic. 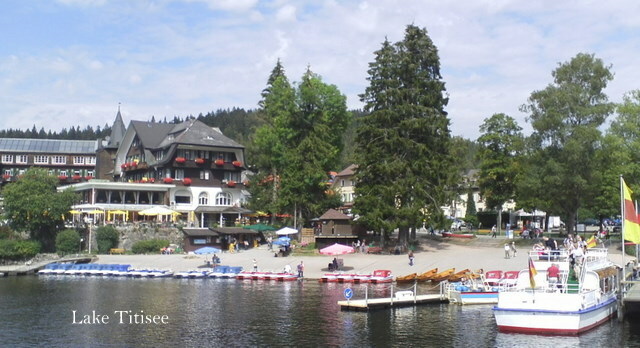 Our hostess decided to take us first to Lake Titisee, some way from Basle across the German border. It reminded me of Windermere with lots of small boats to hire and a larger one which circles the lake. 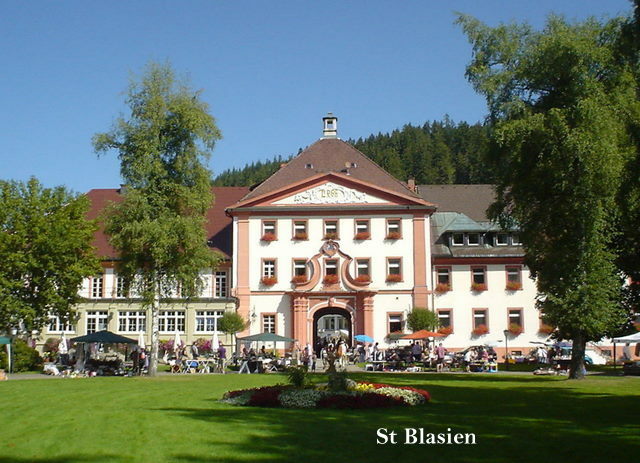 Our second day was also about an hour's drive into Germany, to a small town called St Blasien, where they have annual festival of wood carving. Competitors come from many countries and have to create something to a specification made by the organisers. 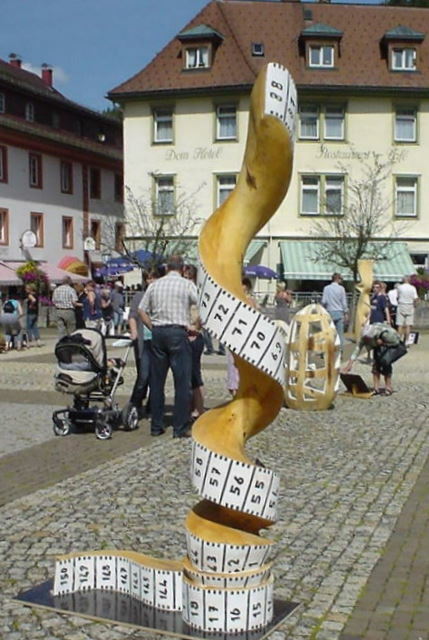 In fact they have to submit a model of what they propose to carve and, if this is accepted, they produce a full sized version, which may be as much as six feet tall. 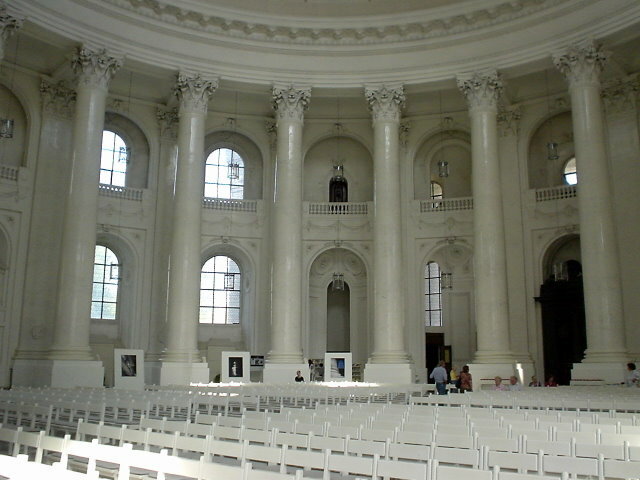 Visitors are then asked to vote for the one they like most. Carvings are then often donated to the town. It was a sunny day and there was a flea market and food stalls and a very busy, happy, atmosphere. 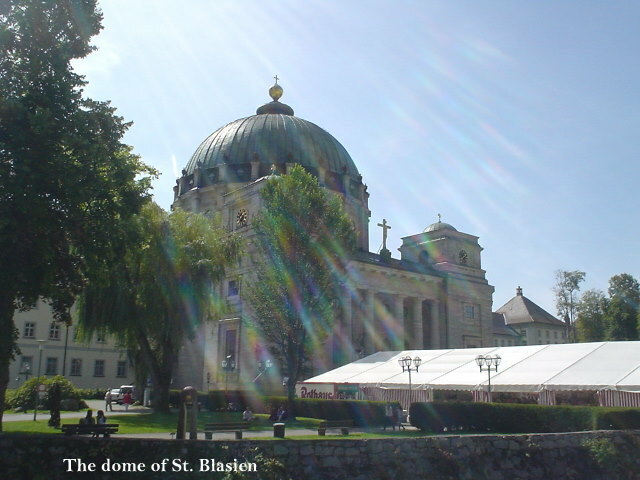 The central square is dominated by the massive, domed church of St Blasien, which has been recently carefully restored. On the third day it poured but our hostess had fortunately planned a party for us and her friends and relatives and a good time was had by all. 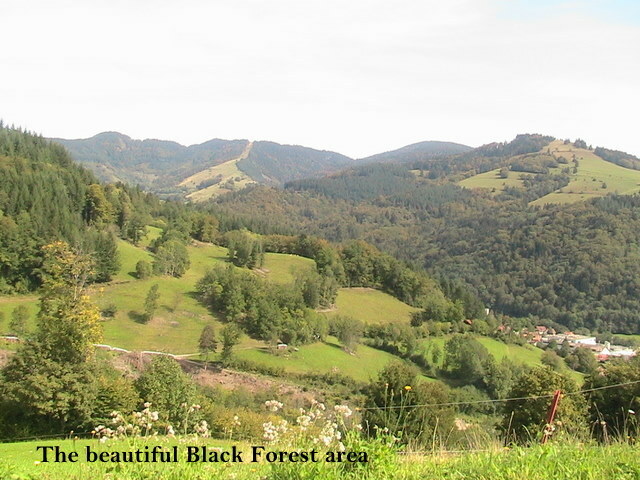 The following day were were back in the Black Forest mountains. To say that the area is beautiful is an understatement. Wherever you go there are what we call 'an area of outstanding beauty'. Every turn in the road revealed gorgeous rolling fields with contented cows or trees, trees and more trees. Yes, we have places in Britain like that... The Lakes, Scotland, parts of Wales, but in this area there is so MUCH of it. 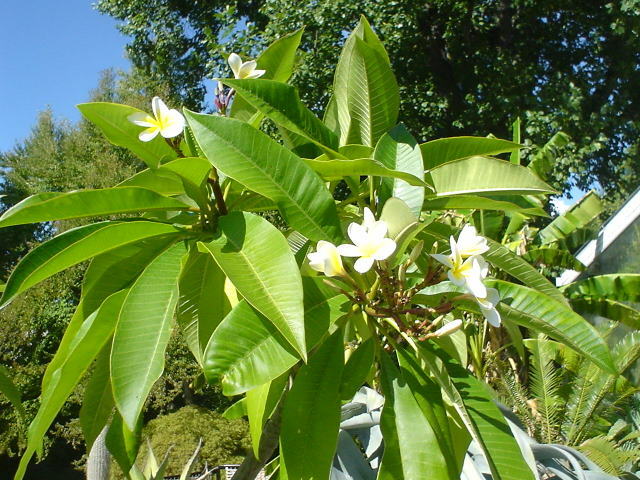 And the Alpine farms, many of them also offering accommodation (Gasthofs) are all bedecked with flowers. In fact the streets and houses in villages and towns are, without exception loaded with hanging baskets. Even minor bridges have their ration of geraniums hanging from their railings. I never saw anyone watering them. They must creep out at night to do that ! Michele drove us up the winding roads, high up into the hills, then a short walk to ******. Most of the Gasthofs have maps of walks around the area and many people go from one to the other. Great walking country with views all around, a warm sun and the smell of pinewoods. Perfect. 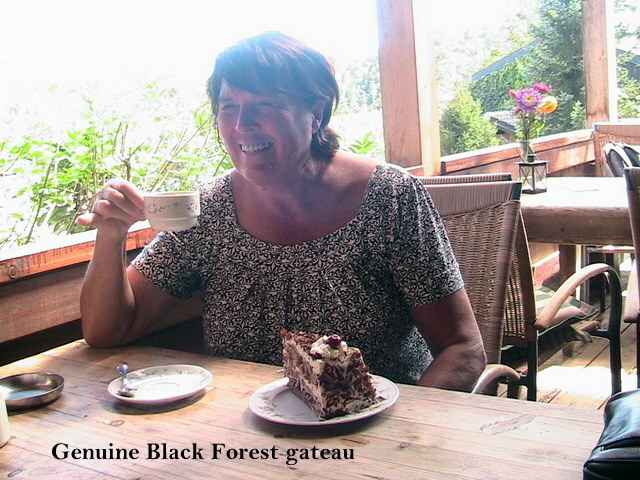 We then finished the day with an excellent coffee and a home made Black Forest Gateau! 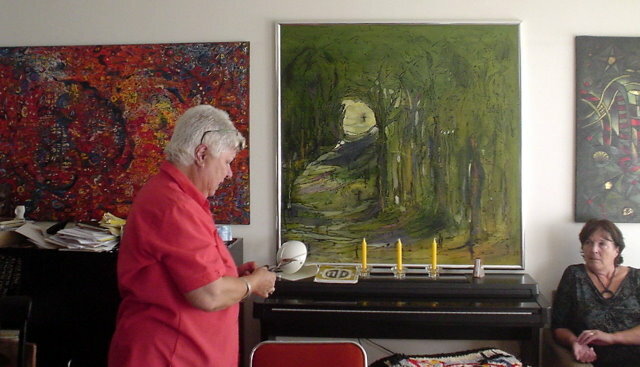 One day we visited another friend who we have both known for over 40 years and, though retired, spends much of her time painting vast modern pieces of art. One day she expects them to be exhibited in the Tate Modern. While there, she took us to the University area, which has many old buildings, some dating from the 11th century. 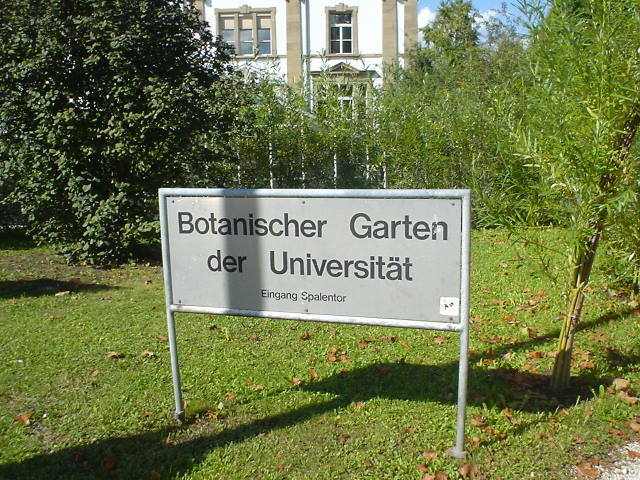 We also had a look round the university botanical garden. 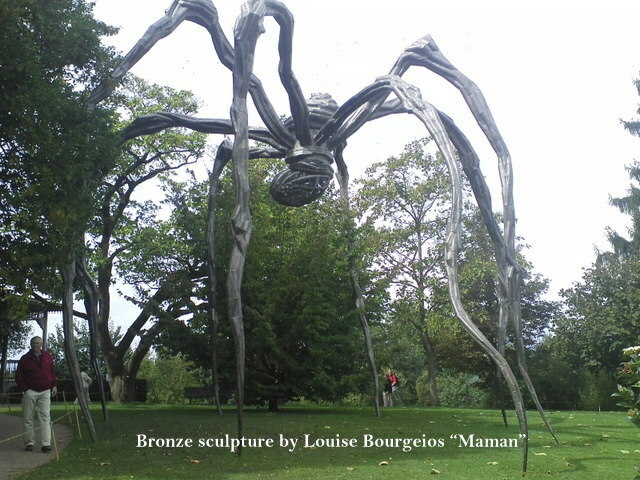 On our final day we were treated to a day on the excellent trams which ply Basel from one side to the other, calling in, at the end of the line (Tram No 6), on the Foundation Beyeler , the grounds of which contained the massive and famous bronze spider 'Maman' by Louise Bourgeois. All in all a superb holiday and one which can be recommended. Only one drawback (from which we were largely shielded, being royally treated by our generous hostess), is the cost of eating out. 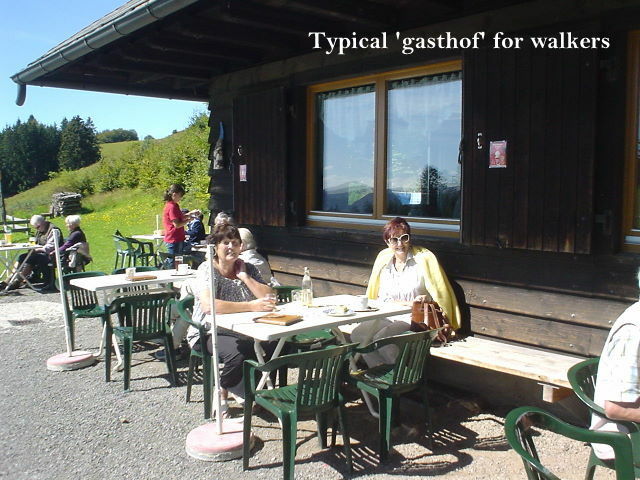 Just sitting outside a pub in Basle, even the simplest meal was at least 24 Swiss francs (around 20 Euros, or £18). As M told us. "If you look at the prices you wouldn't eat !" So, if you are starving, better find a Macdonalds or a sausage stall and have a Bratwurst and potato salad !